No matter your age, breaking things never gets old. The top ten paid App Store games rarely change. Visit on any given day, and you'll see plenty of familiar titles like Angry Birds, Fruit Ninja and Where's My Water? If anything, these money-making machines simply exchange placement, similar to professional tennis rankings. Oh, you want to be number two this month? OK.
That said, the past week has served as a refreshing change of pace. It began with Ndemic Creations' surprise iPhone and iPad title, Plague Inc., grabbing the number one spot and holding it for over a week. Now it's been replaced (at least on iPad) by Chillingo's Catapult King, where players pull back on a 3D catapult and let those cannonballs fly into wooden structures. 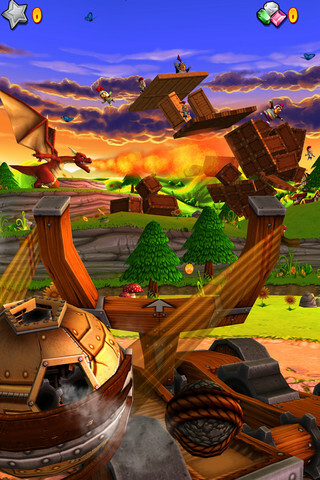 If you haven't tried it, read our Catapult King review. Why is this exciting? Simply because both Plague Inc. and Catapult King represent new intellectual properties that came out nowhere to dethrone the App Store kings. Not sure how long it'll last, but at the very least, it gives hope to aspiring developers that with a quality game, a marketing strategy and some luck, they can hang with the best mobile gaming has to offer.